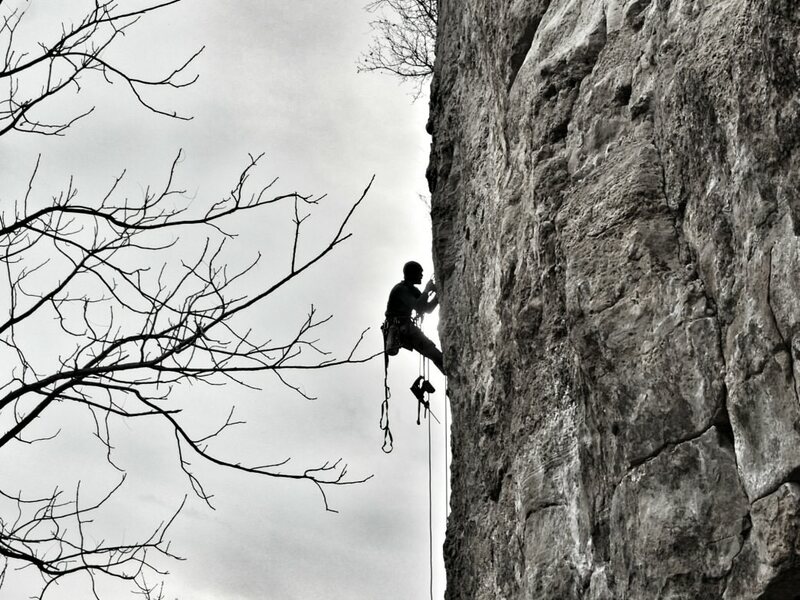 While Minnesota might not be known for its rock, the state’s burgeoning climbing community is looking to change that. Whether it’s sport climbing, bouldering, or ice climbing that you’re into, there are places to climb all over the Land of 10,000 lakes. From the scenic red cliffs of Blue Mounds State Park in southwestern Minnesota to the toughest crag in the state, Palisade Head on the North Shore, there’s a wide variety of options for all experience levels. In true Minnesota fashion, the fun isn’t over when the mercury drops. 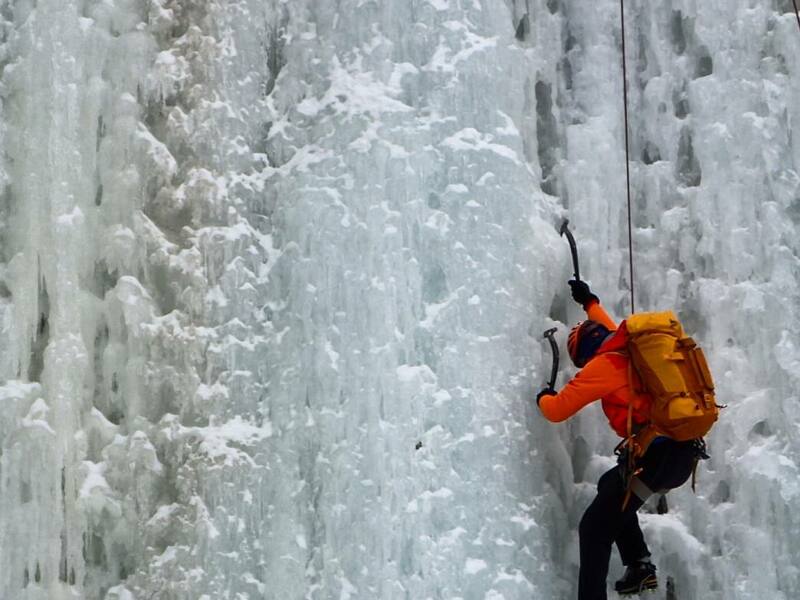 In recent years, ice climbing has gained a following in the state, proving that you can climb outdoors all year round. Be sure to check on any restrictions and necessary permits as you plan your trip. For route guides and information on difficulty levels for various climbs, check out Mountain Project. 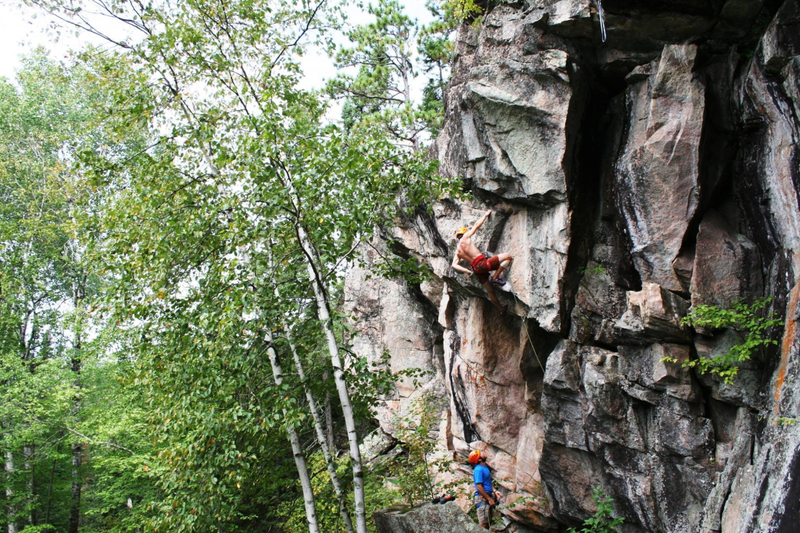 If you’re an experienced climber, you’ll be hard pressed to do better than Palisade Head in Tettegouche State Park , which is one of the best places to climb in Minnesota. With the majority of climbs tougher than 5.10, it’s a great place to hone your skills. 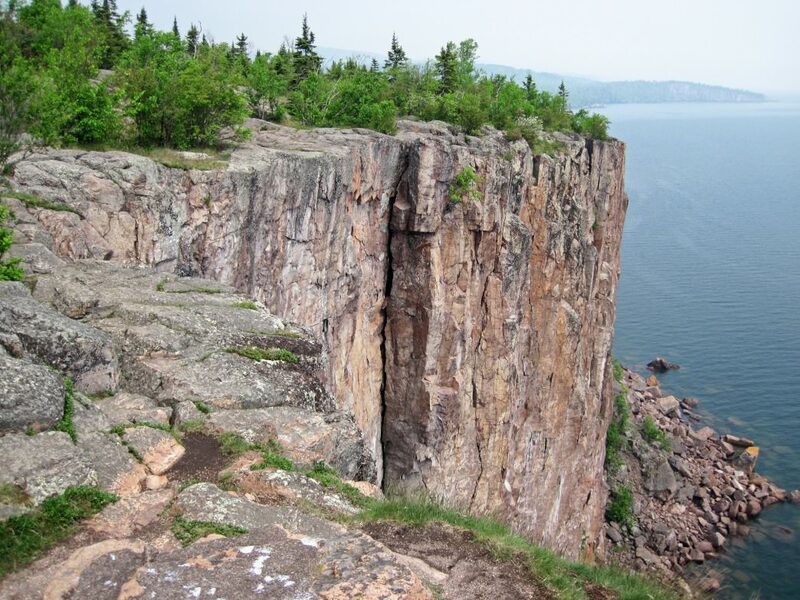 For a slightly more accessible climb, check out the rocky cliffs of Shovel Point. Easily one of the most scenic places in the state, Tettegouche also offers hiking, camping, and expansive views of the Sawtooth Mountains and Lake Superior. Surrounded by prairie, the 1.5 miles of quartzite cliff line that reach up to 100 feet high at Blue Mounds State Park seem that much more imposing. The 50-60 foot climbs range in difficulty from 5.4 to 5.12 and the rock offers many hand and toeholds. A thrilling spot for wildlife lovers, keep your eyes open for the herd of bison or small population of coyotes that roam the park. The hard greyish basalt that makes up the cliffs on either side of the St. Croix River was formed long ago by ancient lava rushing through the area and hardening the rock. 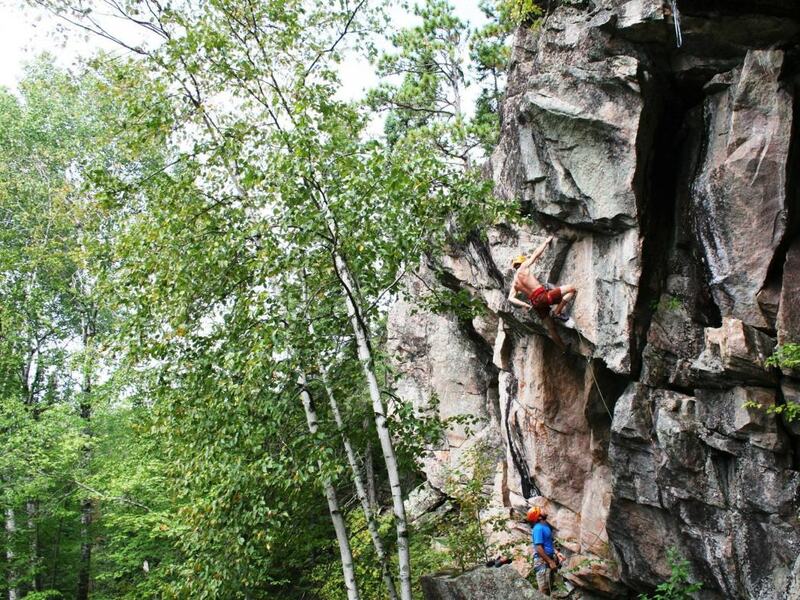 For climbers today, that means crack and face route climbs within Interstate State Park in Taylor Falls. If you’re a beginning climber, this is a great place to go and sign up for one of the DNR’s I Can Climb programs. Designed for ages 5 and up, this 90-minute course will school you on how you can enjoy Interstate Park on the crag. Located in bluff country, the 350-foot limestone Barn Bluff offers a spectacular view of the Mississippi River Valley and downtown Red Wing. As one of the best places for sport climbing in the state, there are over 100 established routes you can try your hand at. Ranging in difficulty from 5.4 to 5.14, there are both mixed and traditional routes. Having become a hub for outdoor recreation in the area, you’ll likely come across plenty of hikers and birders making their way up the trail to the overlook as well. Robinson Park in Sandstone is a unique venue for rock climbing, offering year-round access to sport routes, trad routes, bouldering, and ice climbing and mixed routes in the winter. Touting one of largest ice farms in Midwest, Robinson Quarry Ice Park is home to the Sandstone Ice Festival , a celebration of ice climbing, winter camping, and more. Utilizing hoses and sprinklers at the top of the cliff, the city creates an impressive display of imposing icicles begging to be climbed each winter.